Humor is nice, humor in good taste is better and humor that leaves you with a message other than the LOL's that you had, is the best. I am sure, you would have definitely come across all the three versions of humor that I have just written and would probably also have your personal favorites amongst the all three, reminding you how the humor was an important part of that incident. Humor accompanied with sarcasm is killer, it's like hitting the bulls eye even when you are shooting blind and those who can do this should be called artistic. Is making someone laugh the only aim of humor? No, for sure, and I think you would second me on this. What's the purpose of short lived laughter with humor if doesn't make hit the right chord? Some people excel in this art of sending across the correct message in the guise of humor and leaves you with thoughts to ponder on. 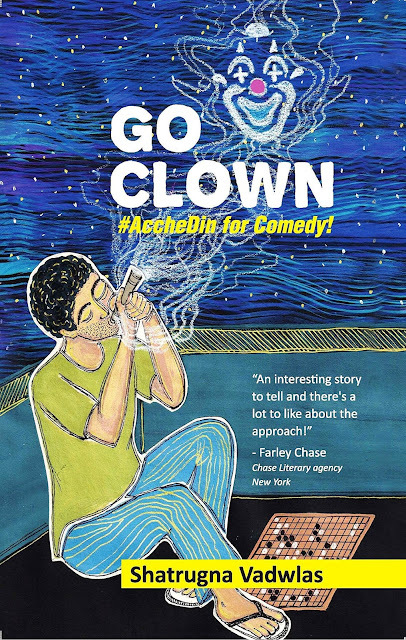 I recently read Go Clown - #AccheDin For Comedy! By Shatrugna Vadwlas an out and out humorous book about the life of the clown, not an actual one but an individual. The book is an attempt at narrating the happenings in the life of an Indian student in a humorously amazing manner. When you start reading the book, you may not know what exactly to expect from it, the initial chapters are all about the building the story, but once you have absorbed the characters, you may feel that it is your story. The story of your youth, the college and hostel days. You will laugh at the story, but the recalling those days and incidents you will smile and may get a bit sentimental too. The story starts with Kiriti, his life, his adventures, he relation with The Clown and his journey from one continent to another. The book talks about various things from Technology to Temperament, from Fun to Family, from Ganga to Ganja, from Shiva to Seclusion and the epic tale of the Go Game and the plan that revolves around it. In the end, the story, of Go Clown - #AccheDin For Comedy!, questions you if it was a reality or a dream? I am sure, by the time you reach this epic epilogue of the story, you will have your own versions and perceptive. Overall, according to me, the book is a tribute to sarcasm and also defines sarcasm for those who don't appreciate it much. It's a dazzling account on humor and a take on hypocrisy and mediocrity. Since Irony has Iron in it, it can be molded into something. Okay, this is my bad attempt at being funny, but be assured there is better comedy in the book rather intelligent comedy. I would recommend this book to anyone who is interested in reading something new and different from the usual stuff. Looks like a good book to read. Hi, Yes, it is worth a read. Do share your thoughts over here when you read the book.